Clubs & Assoc: ANCATS: #15040 GCCFSA: #726 DACO: #DACO110452 Also a member of Foreign Shorthair Cat Club (FSCC) in SA and Feline Association SA. 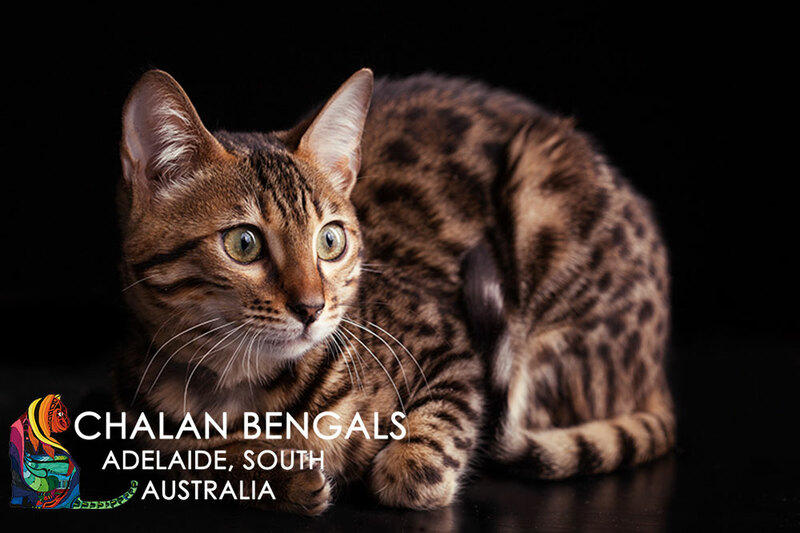 Chalan Bengals is a small in-home cattery in the eastern suburbs of Adelaide, South Australia. We are a responsible, loving, family owned cattery and members of ANCATS (The Australian National Cats Inc), GCCFSA (The Governing Council of the Cat Fancy of South Australia) and FSCC (Foreign Shorthair Cat Club of South Australia). We also hold the South Australian Government breeders license as a registered breeder. Our Bengal furbabies have the classic brown and black spotted/rosetted markings, as well as the stunning silver, snow and charcoal Bengals. All of our Kittens, Queens and Studs have the beautiful soft silky pelts (fur) synonymous to the Bengal breed that are covered with gold glitter. We pride ourselves on producing quality Purebred Bengal kittens that are well socialized and cater to cat enthusiasts throughout Australia. Quality, not quantity, is what we strive for as we pour our time, money, attention and care into each litter. Our Bengals are trained and come well socialized from an early age to interact together and develop great temperaments. Our two young children are very active with the kittens from birth and will get them acclimated to noisy households with small children. As the Bengal kittens get older, they also interact with all the Bengals and cats in our home. Our Bengals are more than just breeding cats, they are part of our family, and treated like our children. They all have their own areas for sleeping, but still have free run of the house during the day. We strive to produce visually stunning Bengals with a strong chin, straight profile, perfect head, and very contrasted markings with little to no ticking in addition to size, health, temperament and intelligence. Breeding Bengal cats is our passion and matching the right kitten to their perfect new home is to us, the very paramount of importance!